Using only the best cleaning equipment in London, we ensure the best possible results in carpet upholstery and curtain cleaning as well as stain removal. Currently we do not offer dry cleaning for our customers but this is in our plans to come on line soon. 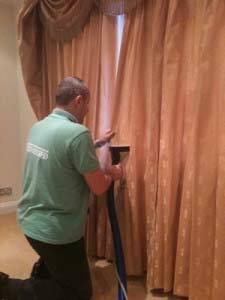 Our curtain cleaning service will more than meet your expectations and your curtains will be dry in a matter of 2-3 hours – smelling fresh, clean and making the whole room look brighter. We have dealt with curtains of all ages from antique window dressings to the most modern of curtains. We know our stuff and we have the right cleaning material to apply to every kind of fabric imaginable and we know exactly how to handle even the most delicate of fabrics. If you have ever had your curtains cleaned you will know the improvement it can make to the whole room. It is something that people often neglect to do, sometimes for years, as curtains rarely appear very dirty. However years of people smoking and just living, as well as sticky little fingers clutching them, can take their toll. You would be horrified if you could see the amount of dirt that comes out of curtains that look perfectly clean! The earliest curtains were made from animal skins. People living in warmer climates would soak them in water and allow the wind to blow through them creating an air conditioner effect. There is evidence that ancient Egyptians tied reeds together to hang in openings for privacy. At the beginning of the 19th century, many people spoke out against the use of draperies, saying they were too expensive, too dusty, and too hard to make.